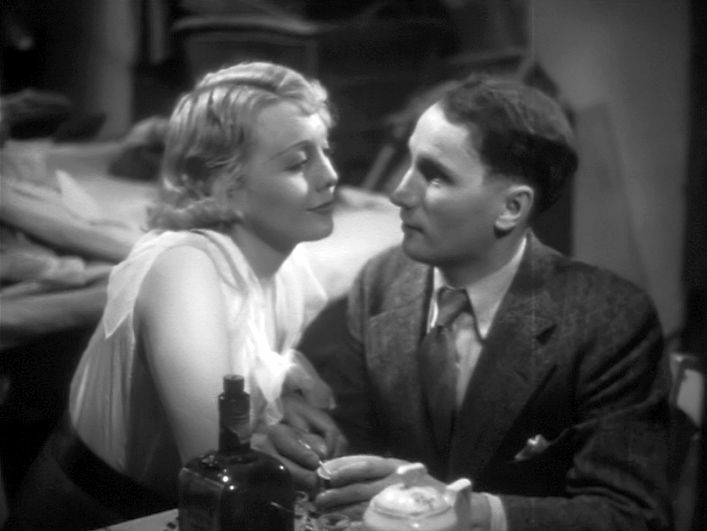 Jean Renoir’s great films of the late 1930s have such a rich social complexity to them that they are sometimes summed up as reflecting his overall “humanism” – although I’m not sure that term does full justice to what Renoir accomplished. Certainly his films encompass multiple layers of fraternal camaraderie, social expectations, and romantic love that involve a number of interacting characters; and these films often have a depth that goes beyond the conventional cinema fare. In fact the first time one sees one of these films, it is easy to miss just how adroit Renoir’s cinematic expression was in these works. Cinematically, Renoir is able to convey multiple subjective perspectives, sometimes all in the same frame of an extended moving-camera shot. Le Crime de Monsieur Lange (The Crime of Monsieur Lange, 1936), was an early oeuvre in this series, and it also happens to be one of Renoir’s more controversial offerings. The story of the film, as you would expect with Renoir, is more than just a political narrative, and it includes several romantic relationships. It is framed as a story told in flashback: an account of the circumstances that led up to the murder. One can think of the plot as comprising five main sections, but the three inner sections make up the bulk of the film. A car drops off a man and a woman (we later learn their names -- Amèdée Lange and Valentine Cardès) to a hotel near the French frontier, and they check in for the night. Immediately the hotel owner’s son recognizes the male guest as a wanted criminal, and suggests to the other hotel workers and patrons in the lobby they turn him in to the police. During the ensuing discussion, the female guest comes out to the lobby and says that she will tell their story to all of them and that they can then judge what action they may want to take. Batala (Jules Berry) runs the publishing house, which is trying to get out its first issue of a pulp detective magazine. It is soon evident that Batala is a dishonest and unreliable manipulator, swindler, and womanizer. Lange (René Lefèvre) works for the publishing house. He dreams of being a successful writer, and his nights are spent writing stories about his fictional creation, “Arizona Jim”. Edith (Sylvia Bataille) works for the publishing house and is Batala’s (current) woman. Valentine (Florelle) runs the laundry in the same courtyard buildling. Estelle (Nadia Sibirskaïa) is a pretty young woman working at the laundry. 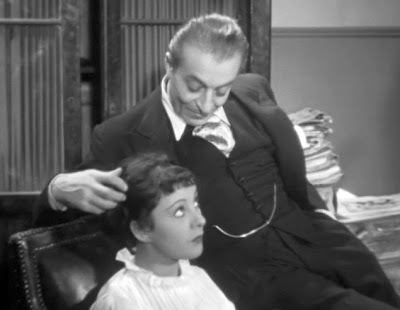 Charles (Maurice Baquet), the son of the concierge, is a bicycle delivery man and in love with Estelle. As is typical with Renoir, the romantic involvements are many. Batala had a past relationship with Valentine, is currently involved with Edith, and eventually forces himself on Estelle and impregnates her. Edith loves Batala and will do whatever he says. 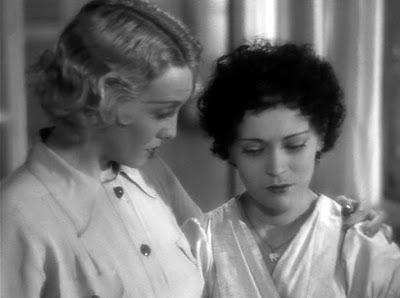 Lange is interested in Edith and Estelle, and later in Valentine. Valentine is interested in Lange. Estelle loves Charles, but shies away from a physical relationship. 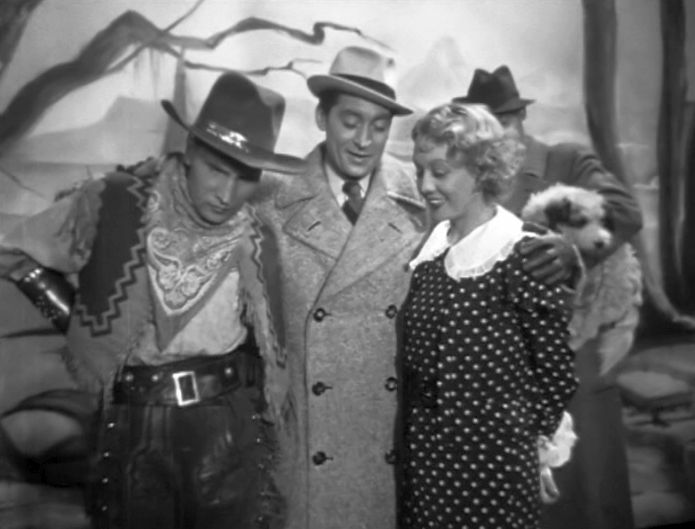 Depicting the evolution of these relationships occupies the bulk of this part of the film. This section closes when the hopelessly in debt swindler, Batala, learns that his creditors are taking legal action against him that may lead to his imprisonment. So Batala heads out of town on the train. News reports indicate that Batala has been killed in a train crash, and the company’s creditors swarm into the publishing house demanding payment. The company staff propose that a worker’s collective be formed to run the business, and the chief creditor, M. Meunier’s son, readily accepts the idea. Soon the rejuvenated company is flourishing by publishing Lange’s “Arizona Jim” comics, which become huge bestsellers at all the newsstands. The “team spirit” of the collective leads to social harmony and effective, cooperative work. Everyone is happy now. Lange and Valentine have become lovers, and so, too, are Charles and Estelle. 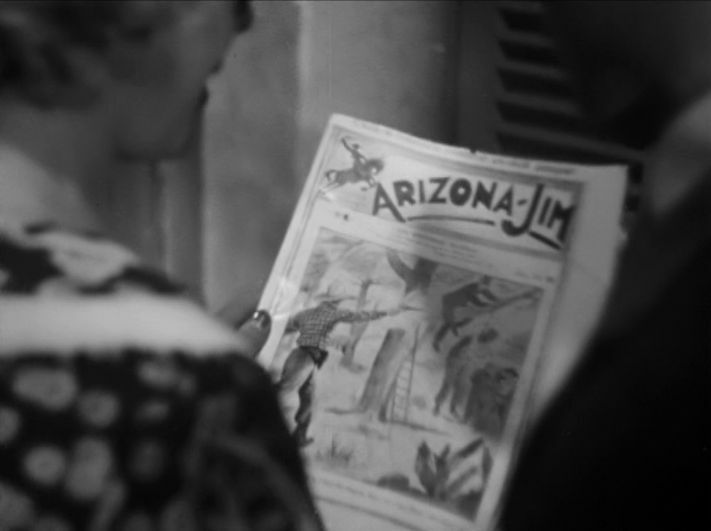 Arizona Jim is such a success that the collective gets a film contract, and they decide to throw a party to celebrate. As the party begins in a dining room in the courtyard, Lange goes upstairs and discovers the presumed-dead Batala dressed as a priest and rummaging around in the company office. To Lange’s horror, Batala announces that he has returned to take what is his. He says he owns all the rights to the company, and he intends to take over again and dissolve the worker cooperative. This is the corrupt 1% restoring its privileged ownership over the 99%, and Lange sees the idealistic dreams of the collective dissolving before his very eyes. After Batala goes out into the courtyard and starts coming on to Valentine, Lange rushes out and shoots Batala with a gun. M. Meunier’s son offers to whisk Valentine and Lange away from the murder scene and take them to the border in his car. We return to the present, with Valentine now having concluded her story to the hotel staff and awaiting their verdict: will they turn them in or let them go? The closing shots reveal what that decision is, with Valentine and Lange making their way on foot along a windswept beach and across the border to safety and an unknown future. The most evidently controversial issue with Le Crime de Monsieur Lange is whether it endorses committing murder for the common good. But in fact there are several interesting aspects of the film worth considering, both with respect to the cinematic elements and to the larger themes presented. With respect to the cinematography, Renoir’s emerging virtues are on display. This includes shooting in depth, featuring multiple, active personages coming in and out of frame within a single shot. In this respect there are several moving camera shots that have drawn considerable attention from critics, most notably during the murder sequence. 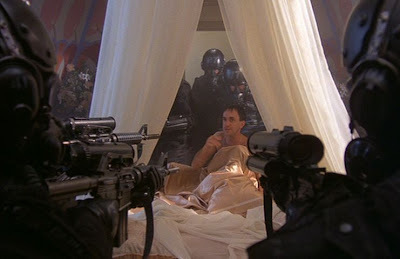 During that approximately three-minute scene, there are several closely joined shots that make the entire sequence seem almost like a single shot. Film scholars have been particularly interested in the shot of the actual shooting, which includes a 270-degree reverse pan shot [1,2]. In that shot, the camera has Lange initially in frame; and then as Lange moves away to the right, it pans to the left, in the opposite direction of Lange’s movement. This pan shot sweeps quickly around the empty courtyard, finally winding up on Lange again, who is now in front of Batala. Why did Renoir choose such a bizarre camera movement at this critical movement? Some critics have suggested that Renoir’s pan was intended to incorporate the social perspective of the collective (the sounds of the celebratory party can be heard on the soundtrack throughout this shot) so as to make the murder an act of “the people” and not just that of an individual [1,2]. I rather doubt this interpretation. Renoir’s pan here is quite rapid (perhaps too rapid) and not the sort of deliberative and circumspective movement that would incorporate all that it surveys into its overall perspective. It is true that the shot does distance the viewer from Lange at this decisive moment, thereby building up dramatic tension, but whether the shot truly incorporates a socially communal perspective is doubtful. Both films were scripted principally by Jacques Prevert. Both films are told in flashback about a murder that has just been committed. In both films, the murdered man is an unprincipled and almost satanic shapeshifter stylishly played by Jules Berry. The seemingly only way to thwart this treacherous threat is to kill him off. Despite these similarities, the two films seem quite distinct to me. 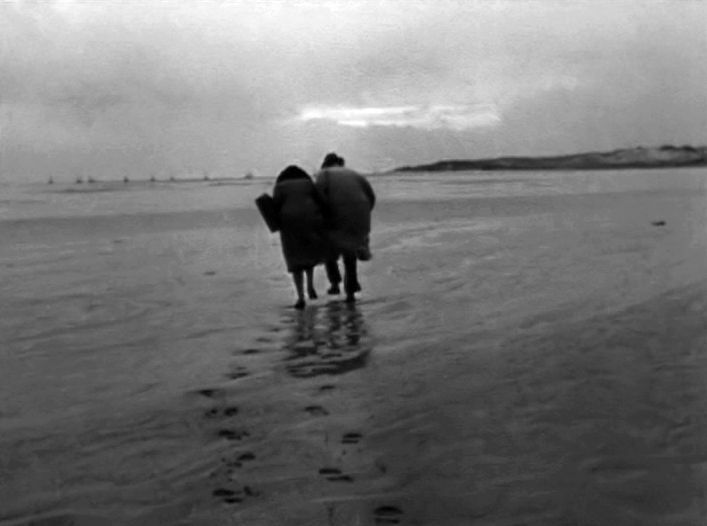 Le Jour se Léve, the superior film, is a moody, existentialistic story about love. 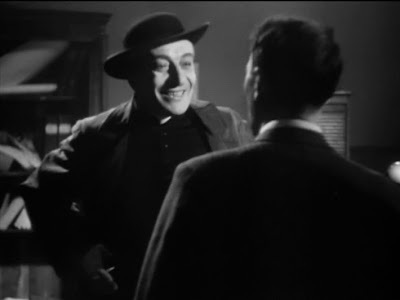 The viewer gets inside the head of the later film’s protagonist, François, and empathizes with his concerns and anxieties. With respect to Le Crime de Monsieur Lange, however, the perspective is more socially inclusive, and although the viewer sees the Lange character sympathetically, the view is primarily from the outside. 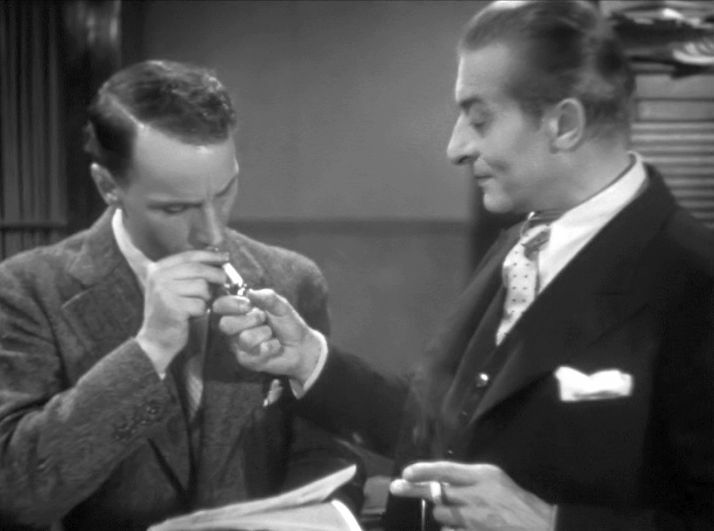 Thus Le Jour se Léve is more subjectively romantic and Le Crime de Monsieur Lange is more objectively political. Given the fact that Prevert scripted both films, we can assume that this distinction between the films largely reflects the differences between Carne’s and Renoir’s cinematic visions and styles of visual storytelling. In fact this is what makes Renoir so interesting. His cinematic storytelling style often incorporates multiple perspectives and is consequently both romantic and political at the same time. But these two perspectives are not just stuck together in an ad hoc fashion without coherence; instead, these two angles seem to fit together into a larger human landscape. Most critics and film scholars have focused on the political side of things, but the romantic side of this film is at least as important. Thus there are viewers (in fact, sometimes even a single viewer on different occasions) who have liked this film for quite different reasons. So what are we to take away from Le Crime de Monsieur Lange? Certainly we can’t endorse Lange’s murderous act, even though we know that this simple-minded man wanted to remove a miscreant whom nobody would miss. Was the worker’s collective also such a simple-minded dream that it could not really work in the real world? According to Renoir’s optimistic presentation here, it could work, and this is where his inclusive humanistic vision comes into play. The collectivist idea could work on a larger scale, but only if the socially collectivist structure is supported by the willing, compassionate engagement that underlies the spirit of this movie. The political solution will not work without the romantic spirits, and this romantic spirit is most movingly expressed by the women in Renoir’s film, not the men. Reader, Keith, “The Circular Ruins? Frontiers, Exile and the Nation in Renoir’s Le Crime de Monsieur Lange” (2000), French Studies, vol LIV, No. 3, pp. 287-297. O’Shaughnessy, Martin, “Breaking the Circle: Le Crime de Monsieur Lange and the Contemporary Illegibility of the Radical Text” (2011), South Central Review, 28:3, pp. 26-44. 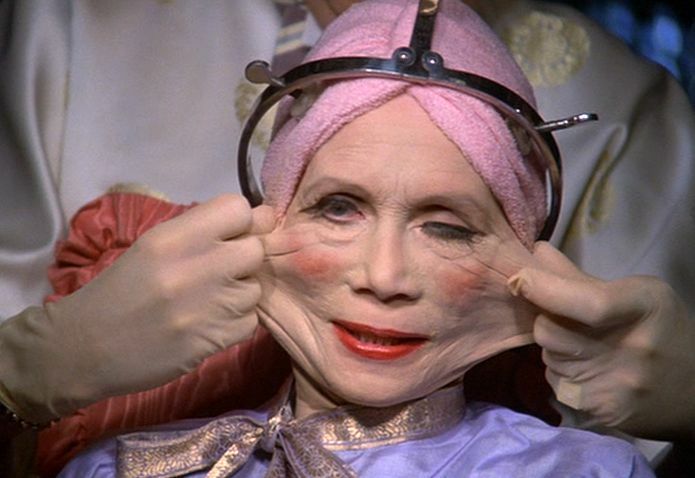 Brazil was not a commercial success upon its theatrical release in 1985, but I hold it to be a monument in Expressionistic filmmaking and also one of the greatest films ever made. Not only does the film cover universal issues of human aspirations and feeling, but it also shows us how these are being jeopardized within the ever-enclosing social frame of our modern world. This concern about oppressive social control, of course, is not new. Indeed the issues that Brazil raises concerning how the misuse of information threatens the viability of our social enterprise go back to the 1949 publication of George Orwell’s novel 1984, a story which is Brazil’s thematic inspiration. But in some ways, Brazil presents this threat as an even more comprehensive and disturbing problem than Orwell did. I will return to this issue later. 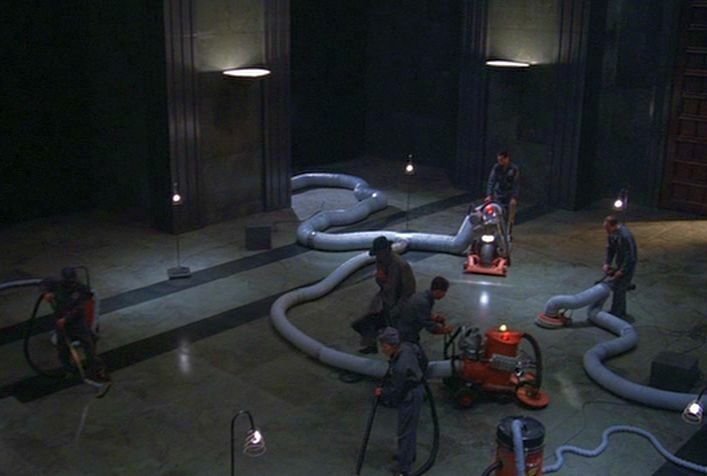 From the opening scenes it is evident that the evocation of 1984 is woven into Brazil’s very aesthetic fabric. Although Brazil’s story is said to take place “sometime in the 20th century”, the architecture, clothing fashions, and everyday technology all appear to be very much that of 1949. But beyond those similarities, what takes place in the film appears to be an almost apocalyptic vision of the future seen through a 1949-dated Orwellian lens. This quasi-futuristic (sometimes called “retro-futuristic”) vision is enhanced by what would have at that time (in 1949) been futuristic technological advances, such as computer technology that is a bit more advanced than that of the otherwise early 1940's - 1950's style. "Loose Talk Is Noose Talk"
Lowry works for a division within the ministry, the Department of Records, where all this gathered information is stored. But there is also another division in the ministry, the Department of Information Retrieval, which is responsible for collecting and maintaining the “integrity” of the information. Of course we know that information technology is immensely valuable in today’s society. But the problem with the modern and conventional, but naive, view of information is that it is all assumed to be objective and timeless. In truth, however, the “information” that is collected is always associated with some physical interaction in the world, and this invariably has some context, which is never completely captured. In fact as the computational artificial intelligence community discovered some time ago, this invariably-present interactive context is usually too vast to be collected and stored for each interaction. So compromises must be made; some of the context must be ignored. For the kinds of interaction examined by the physical sciences, this is less of a problem, because physics and chemistry attempt to derive physical laws that are more or less context-independent. But for the interactions involving complex systems, particularly involving biological organisms such as ourselves, everything is connected to everything: the extended interactive context can only be ignored at our peril. This is why sharing information indiscriminately and without regard to the original authentic context and the concerns of the original interaction participants can be misleading and harmful. But such pervasive and contextually ignorant information gathering and processing is exactly what is happening on in Brazil’s society, and it is also happening in our society, as well. As a result, serious mistakes can happen. One such mistake marks the opening event of the film. Despite the inevitable weaknesses of aggregating a vast mountain of “objective” information, Brazil’s tightly controlled society obsessively works to do just that. And to support this effort, the government seeks to keep track of everything that happens so that no terrorists can take advantage (yes, in Brazil, made long before 911, the government employs the specter of terrorism to justify their invasive policies in the same way that modern governments do). In the face of this stultifying and mechanistic obsession with information collection, Brazil depicts a few key individuals who seek to preserve the intimacy and authenticity of their private interactions. In fact if you think about it, this is what true love is all about: it is a unique, totally engaging and immersive encounter between two individuals that cannot be shared or objectified. In Brazil’s grim world of universal information storage and retrieval, Sam Lowry dreams of the uncanny, irreducible magic of romantic love. The story of the films looks at what happens to these dreams. At the outset, the film shows an office in the Ministry of Information’s Department of Records, where a dead fly falls into a printer, causing it to mechanically misprint a person’s name. Instead of Mr. “Tuttle”, a debtor’s invoice winds up being assigned to Mr. “Buttle”. Straightaway, armed policeman break into Buttle’s apartment and take him prisoner, and soon Buttle dies of a heart attack while being tortured under interrogation. But this film is not about Buttle and his family; it’s about people on the periphery of this opening event. Buttle’s arrest was witnessed by his upstairs neighbor Jill Layton, and Sam Lowry’s Depart of Records is involved in this mistake, as well. In this opening section of the film, the viewer is introduced to Lowry’s life and acquaintances. These include his old friend Jack Lint (Michael Palin), a superficially friendly social climber and confident extrovert who works in the Department of Information Retrieval and who is the social opposite of Lowry, the sensitive and perceiving introvert. There is also an introduction to Lowry’s work environment in the Department of Records and to Lowry’s vain and wealthy mother, who is dedicated to rejuvenating herself via plastic surgery. Lowry’s nights are filled with romantic dreams of him being a superhero soaring through the clouds and rescuing his imaginary beautiful maiden and true love from fantasy monsters. 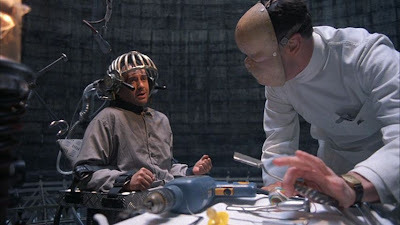 But in the midst of all the inertia and drudgery of Lowry’s bureaucracy-filled world, he happens onto one person who is entirely different from all this – a mysterious freelance repairman who shows up at his apartment and fixes mechanical infrastructure that has broken down. This free soul turns out, in fact, to be Mr. Archibald Tuttle (Robert De Niro), the originally intended addressee of the government’s misdirected invoice. He had quit working for the government’s Central Services and become a rogue free-lanacer, because he couldn’t stand all the bureaucratic paperwork. 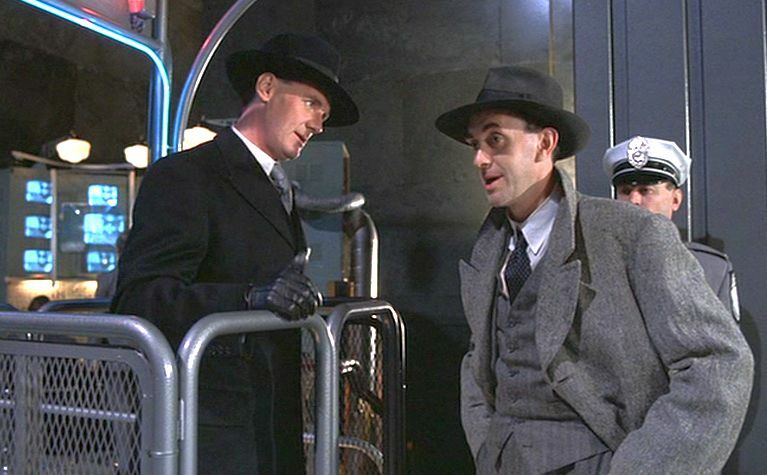 Although Lowry is generally powerless in the outside world and powerless (without Tuttle’s help) to deal with the mechanical failures of his apartment’s heating system, he is an invaluably proficient operator at his office in the Department of Records, where his human touch is occasionally needed to solve simple problems that have not been accounted for in the government’s procedures. On one such occasion while delivering a refund check to Buttle’s widow, he catches a glimpse of the neighbor, Jill Layton, and he recognizes her as the fantasy maiden of his own dreams. She runs away before he can find her, but he does manage to learn her name. So at this point in the film, we understand Lowry’s circumstances and his quest: to find Jill Layton. His adversary in this quest will not turn out to be a specific person, but will be the system itself. 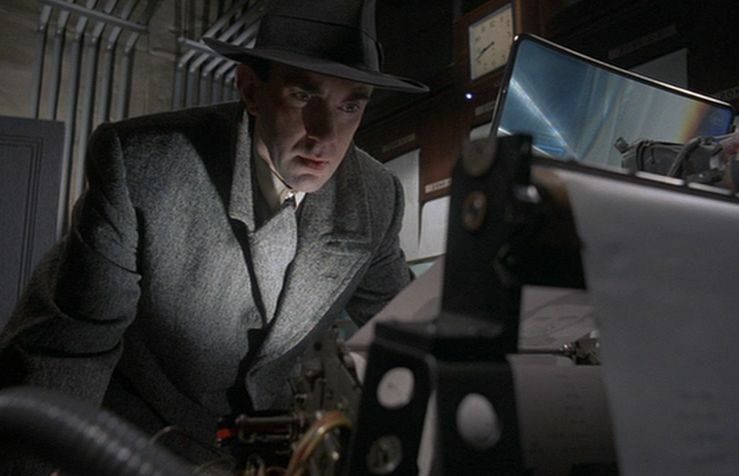 At his office in the Department of Records, Sam learns that Jill Layton’s file is classified and held by the separate Department of Information Retrieval. Evidently Jill is suspected of terrorist associations, and Sam realizes that she is in danger. To get access to Jill’s records and help her, Sam will need to get a position in that separate, secretive division. So he reluctantly seeks the aide of his socialite mother to see if her influence can secure him a job over there. In the meantime Sam finds his apartment in a shambles due to pugnacious workers from Central Services who are peeved to learn that the outlaw repairman Tuttle had fixed his earlier heating problem. Here again the system shows its ugly face. Finally his mother’s influence lands Sam a job and a tiny office at the Department of Information Retrieval, where he ultimately learns that Jill’s personal file is held in a special room where torture-filled interrogations are conducted by Sam’s friend, Jack Lint. Sam goes there and manages to talk Jack into giving her Jill’s file. Sam’s goal is now to find Jill and save her from being taken by the authorities. In the nick of time, Sam sees Jill at the front desk of the Ministry of Information and rescues her just before she can be arrested by the police. Jill is suspicious of Sam’s government affiliation and runs away, but Sam persists and succeeds in mollifying her concerns. Shortly thereafter while visiting a department store, however, an attack by unknown armed men causes mayhem and the police arrest Sam and Jill. Sam is let off, but he is now ostracized by his new boss and his old friend Jack for aiding a “terrorist”. When Sam returns to his apartment, he discovers that is has been taken over and wrecked by the antagonistic Central Servicemen. The mysterious and oddly heroic Tuttle again shows up and settles the score. Jill somehow shows up, too, and now she is showing signs of responding to Sam’s amorous longings. They retreat to his mother’s empty apartment, but before making love, Sam rushes out to perform a heroic act. He will break into the Department of Information Retrieval and destroy Jill’s files, so that she will disappear from their surveillance system. This he manages to do, and they then spend a night of heavenly bliss together. But in the morning the romantic spell is emphatically crushed when the police crash into the apartment and arrest the two of them in bed. Under arrest and put into solitary confinement, Sam is informed that Jill is dead. He is taken to a tower torture chamber, where some unspeakable torture is about to be performed on him. 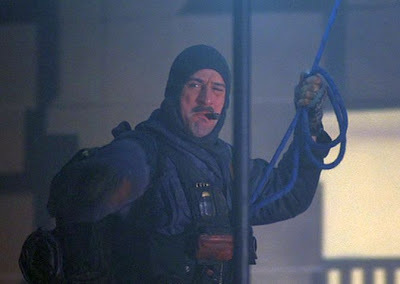 Just before the torture session is about to commence, though, Tuttle and his allies miraculously break into the tower, killing Jack and rescuing Sam. Sam and Tuttle run away, but not before blowing up the Ministry of Information building. But things are becoming more and more surreal by the second. In a chilling scene, Sam’s savior, Tuttle, is engulfed in windblown newspapers and disappears altogether. Sam makes it back to his mother’s apartment, escapes another armed police attack, and eventually finds himself in a prefab home that is being carried on a truck driven out of town by Jill. The two of them will escape together to a romantic sylvan paradise, far removed from the government’s oppressive control. But this entire getaway turns out be just a dream. In the narrative world of Brazil, the adversary blocking the attainment of the narrative goal is not an individual or a group, nor is it even an obstacle-laden or dangerous natural environment, such as a mountain to climb. No, as I said earlier, the adversary here is a system that is based on a misconception of information. The clever way this is depicted is what make the story, scripted by director Terry Gilliam, along with Tom Stoppard and Charles McKeown (who also has a memorable bit part as “Harvey Lime”), so effective. The cinematography and special effects in Brazil are remarkable even by today’s standards. There are all sorts of eccentric but mood-inspiring moments, and they flow together into a smooth continuity, even affording such moments as Gilliam’s explicit homage to Segei Eisenstein’s Odessa Steps sequence from Battleship Potemkin (1925). The expressionistic presentation not only establishes an evocative mood but also carries semantic import. 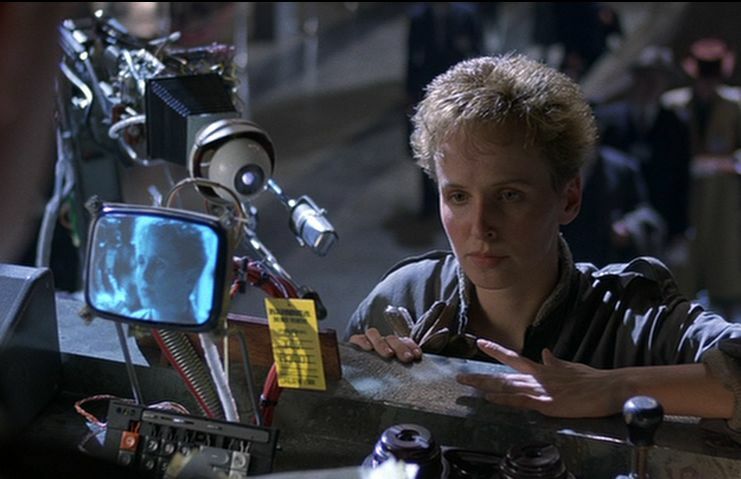 Throughout the film there are constant visual reminders of the “mechanical” way that context-stripped information is transferred and crudely used in this society. In fact many of the mechanical operations depicted seem clumsy and subject to failures. Whenever Sam takes an elevator, it seems to malfunction in some way. This is the way of mindless, brute mechanics. In terms of physical architecture, there are bulky heating and cooling ducts everywhere, symbolizing the blind connectedness of everything and everyone. But this connectedness is purely mechanical and lacks the subtlety of truly situated interactions. At one point Sam Lowry gets frustrated with the relentless transmission of pneumatic information tubes in his office, so he hooks the "input" and “output” tubes together so that they effectively (and symbolically) create a “short circuit”, which causes the entire pneumatic tube system to blow up. 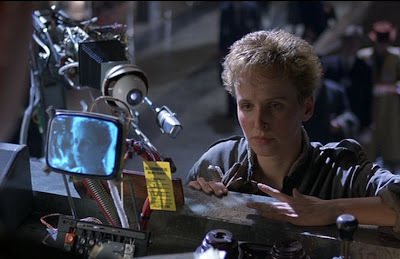 This blind connectedness of information flow, without attention paid to the subtlety of interactions, has caused everyone in the society shown in this film to avoid responsibility. To remove any shred of meaningful commitment and responsibility from government affairs, people are constantly required to sign fine-printed authorizations that remove perpetrators from further responsibility. (This may remind you of the many occasions you are required to read a lengthy and virtually unreadable authorization statement on a Web page and then mouse-click your acceptance of it.) So everyone here is supposedly connected via information transfer, and yet everyone is actually disconnected from any meaningful interactions. Thus in one scene when armed attackers enter a restaurant, most of the patrons pay no attention – because it is none of their business. The misuse of information transfer in the society shown here has cheapened, if not eviscerated, true human connections. A reminder of how our own current “information society” can so readily dismantle people’s lives via shoddy information misuse came to the fore recently in connection with news about Neda Soltani. She was an Iranian university lecturer who in the wake of the disruptions associated with the corrupted presidential “election” of Mahmoud Ahmadinejad, was mistaken for another woman, Neda Agha Soltan, who was shot dead on the streets of Tehran during a demonstration. Journalists and bloggers found Ms. Soltani’s photograph and spread it around the Internet as a picture of the murdered girl who was considered a martyr. This mistaken identity error (like “Buttle” and “Tuttle”) more or less wrecked Ms. Soltani’s life, and she was fortunate to escape Iran before the government secret police could get their hands on her. With respect to this theme of information misuse in Brazil, there are two specific aspects of the story that I would like to mention: the matter of Tuttle and the matter of the film’s ending. The Archibald Tuttle character has only a few brief appearances, and yet his persona is crucial to the story. He is not someone who transfers misleading “information” around, instead he does things. He is a man of action and interaction. When he comes to Sam’s apartment, he knows exactly how to set things right, and then mysteriously and gracefully flies away off the apartment balcony, suspended by a high wire. How does he know that Sam is a compatriot in this struggle? In fact he is the embodiment of a spiritual savior, but he doesn’t operate on the plane of noble thoughts and ideas, but in the world of action. At one point he says to Sam the same thing that appears as a big-lie shibboleth on government wall posters: “we’re all in this together”. When the government says it, it means implicitly, “we know everything about you”. But when Tuttle says it, he means something different – that he and Sam are meaningfully connected in an authentic engagement. This is an engagement that cannot meaningfully be put down on paper, and Tuttle hates paperwork. So it is memorably disturbing at the film’s end when Tuttle is overwhelmed by discarded newspapers and swept away. This brings me to the matter of Brazil’s ending. 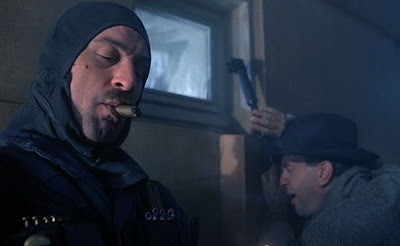 When the film was to be released in the US, the American distributor, Universal, feeling that Gilliam’s ending was too bleak and would displease American audiences, demanded a re-edit so that it would have a happy ending. But I believe that Gilliam’s original cut does have a happy ending – much better and happier than any superficial rescue scene. 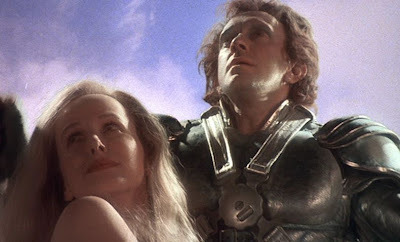 What Brazil celebrates and what is highlighted by Gilliam’s ending, is our belief that dreams can be real, that wrongs can be righted, that love can be found and fulfilled. At the end of the film, Sam’s spirit is unbroken.